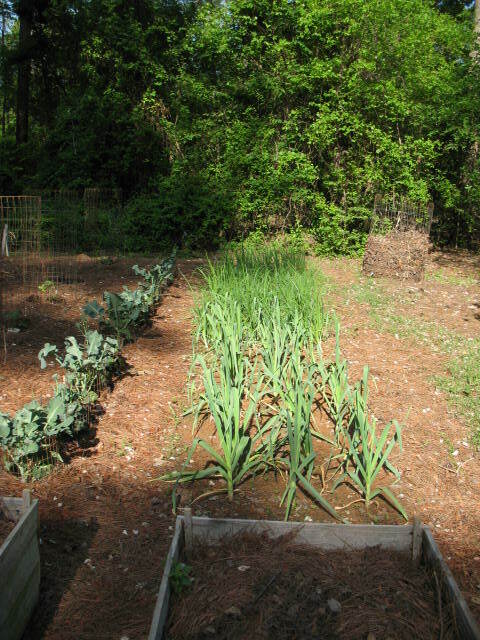 Onions are one of the plants that it makes a lot of sense to grow in your garden. They are so cheap and easy to grow, and they are so expensive in the grocery store that it’s really a no-brainer whether to plant them or not. An onion may cost as much as a dollar in the grocery store, and I can raise a couple of hundred of them for five dollars. My onions may not be quiet as big as the ones at the store; but they are a lot cheaper, and they don’t have any pesticides sprayed on them. I buy onion sets and the local hardware store and plant them in late February to early March. I plant them in a 3 foot wide bed about 6 inches apart in each direction, broadcast a little 8-8-8 fertilizer on them, and water them well. You will have to weed them a time or two as they are growing, and keep them watered if the rain is not regular. When the green tops begin to die and fall over in late May, they are ready to pick. 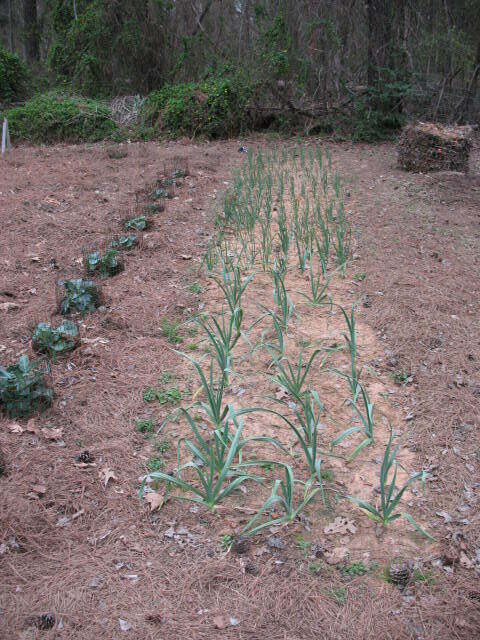 Pictured below: Bed of garlic and onions early in the season and then later on about two weeks before harvest. Garlic is in the foreground, and onions are in the back. After picking I brush the dirt off on the onions and lay them out on a table under my porch to cure for a week or two. When they are cured and the tops are pretty dry, I braid the onions into strand about a foot and a half long, tie the ends with string, and hang the braided strands from the beams in our living room (I know, it sounds weird, but it doesn’t look that strange in our country home). 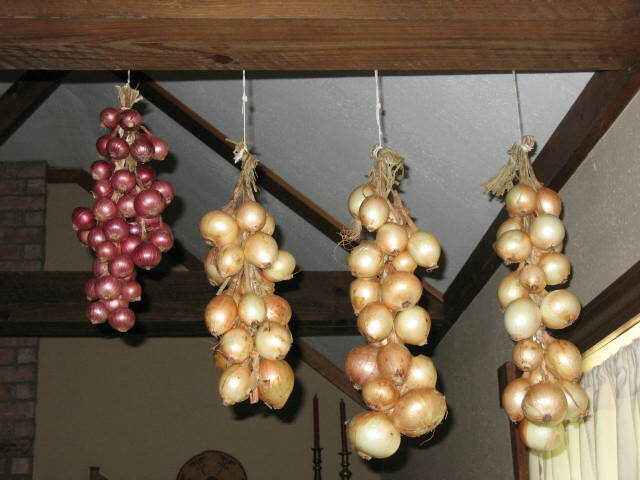 Pictured Below: Onion braids hanging from a livingroom beam. Now we have a good supply of onions to use throughout the fall and winter. All we have to do is walk into the living room with a pair of scissors and snip an onion or two off of the braid. Easy, fun, and money saving. Who could ask for more? I enjoy your advice and experience, and it is well written. Your advise dove-tails with my previous experiences and I cannot fault you anywhere. I wish that I had had your insights when I was learning the hard way and still fit enough to apply it. A friend stores his onions by using nylon stockings and tying a knot after each onion is inserted. It is not nearly as decorative, but it works well. In Latvia people do same but without knots. Now my irish onions I store in net bags that cabbages at greengrossers come in then tie them to something in the kitchen so they hang. I do not bother untying them, instead made a hole on the side close to the top and pull them out as needed. Leeks and onions come in net bags too, when ordered in bulk for restorants and such. Although might be different in America. I get bags from restorant I work in, also big 5 liter square buckets with lids that so handy for so many things like storage, keeping coal in, even good size for a tomato plant to grow in. Have no patience to make onion or garlic plat, but they look nice, maybe try next year. In Ireland we plant some varieties of onion and garlic in the autumn, and up till Christmas, as it’s not too cold here so they survive OK. Haven’t done it yet, and it’s so dark, cold, wet and windy outside, must find time some weekend to do so.